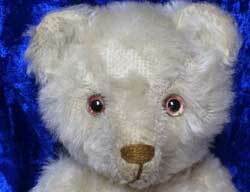 The German Teddy Bear could be said to have been with us since 1908 but this is technically wrong. Yes it is true that from 1908 soft toy bears made in Germany were marketed as teddy Bears due to the popularity of this term from America. 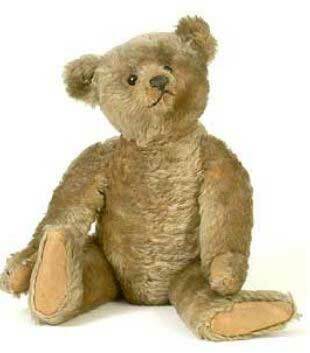 However the German toy market had been making toys bears from before the 1900's in one form or another, but the soft toy bear form we know and love appeared around 1902. The German toy industry during the early years of the birth of the Teddy bear produced bears which many considered to be some of the finest ever made. The teddy craze which had taken hold and seemed to be getting even more popular throughout America and Europe during the early 1900's spurred on many new German teddy bear companies to be formed. Competition was intense and many of the new companies had to make sure that they not only produced top quality bears but also come up with their own unique branding, which they protected fiercely. The following German Toy and Teddy Bear Companies are just a small selection of the manufacturers around during the early years of production and who were considered some of the best. 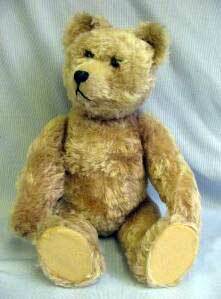 Steiff are of course the most famous Teddy bear company in the world. Everyone knows the name and their famous trademark button in the ear of their soft bears. Steiff were also very inventive in their fight to stay ahead of other companies and they often experimented with different designs and materials, as well as inventing new ways to make the movable joints. Their invention of using a disc joint made from heavy card in 1905 was so successful that this method is still used today. Early Stieff Teddy Bears had very realist facial features, however this style was soon thought to be a little too frightening for children and more baby like features were developed. This development has continued over the years along with has changed with differing changes in taste and fashion over the decades. Founded in 1863 as a company which made tin kitchenware and then tin mechanical toys. They moved into making soft toy bears when the craze took off in Germany which put them in direct completion with Steiff. Early Bing teddies are have a much sweeter look than Steiff bears at the time and have rounder faces with small ears and shorter snouts. Their trade mark began as an arrow shaped tag in the ear which later turned into a stud under the arm. 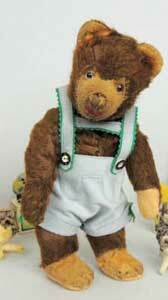 This company also made some mechanical soft toy bears which tumbled, skated or were acrobatic. Eduard Cramer was born in 1858 and trained as a tailor. However due to lack of work he began to use his skills to design soft toys. Many of his designs were rather different and were often brightly coloured but were always top quality. Cramer bears can also be identified by their often very expressive faces, shaved heart shaped snout and large flat feet which enabled them to stand upright. Founded in 1912 by Heinrich Muller who once worked for the Gebruder Bing company and his partner Heinrich Schreyer. They specialised in mechanical German Teddy bears of which their most famous bear was known as the "Yes/No" bear which had a tail which operated the head to shake yes or no. Later the company began to make unusual Miniature teddy bears which contained items such as perfume bottles, lipsticks or even pots of jams. However this design soon changed to please to toy market and much softer features were employed to entice children to choose them over their American teddy counterparts. Often long arms and legs with a long torso can be said to distinguish many of the early German teddies.